Server monitoring should be simple. How can I easily manage all my servers and apps? Monitor server uptime with 1200+ monitoring templates across your private, public, and hybrid cloud environments. What should I be monitoring on my Windows servers? Predefined templates have you covered. How can I monitor my special and custom apps? It’s easy to monitor a process, service, or application. Application and server monitoring simplified. Server monitoring for any application, any server, anywhere. Server monitoring for Windows and Linux applications and operating systems and IT infrastructure located on-premises, in data centers, remote locations, or in the cloud. Comprehensive server monitoring software for Microsoft applications, systems, hypervisor, IaaS, PaaS, and SaaS services. 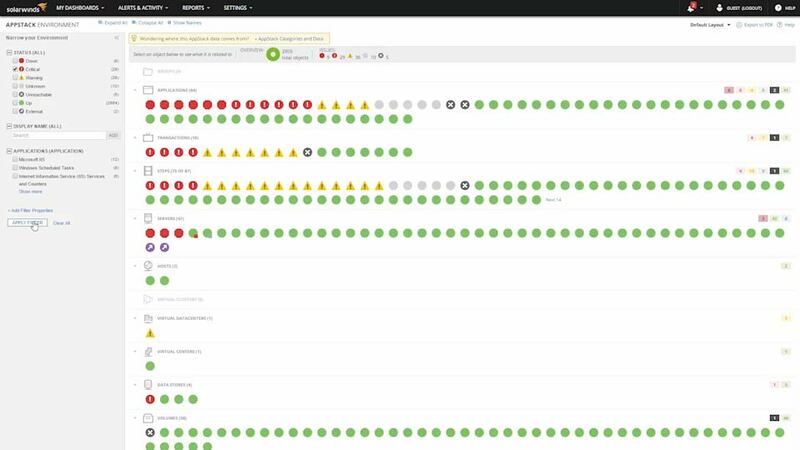 Monitor, alert, and correlate across Azure and AWS IaaS, PaaS, and SaaS services. Monitoring templates for 1200+ vendor applications, servers, databases, and infrastructure, all in a single, easy-to-use, customizable web interface. Customizable server monitoring allows you to monitor any process, services, or application in just a few clicks. Features Overview Server monitoring for any application, any server, anywhere. Server monitoring software that is an industry favorite. Hands down. "Compared to using custom scripts, SolarWinds® Server & Application Monitor is easier to use, provides at a glance availability, and email notifications with automated service restart availability." "The best feature is the automated restart and notification." Where can I find information on installation and customization for my SAM product? Does SolarWinds offer training or certification for the SAM product? Our New to SAM section was created using customer feedback and contains videos, guides, and articles that will help you be more successful with your installation and customization. SolarWinds offers an onboarding assistance program called Smart Start if you are looking for help getting SAM server monitoring tools set up and optimized. We will provide you with access to one of our implementation experts who will work with you to understand your goals, assist you in installing and configuring your product, and help you optimize your environment for how you need your business to run. SolarWinds offers a certification program for SAM called the SolarWinds Certified Professional®(SCP). Becoming a SolarWinds Certified Professional helps ensure that you have the technical expertise to effectively use and maintain SolarWinds network and systems management products. With server monitoring, you can quickly fix active issues and help prevent future ones by tracking and trending server performance over time. Servers and applications are the backbones to your business. Without proper server monitoring, you’re likely to experience performance issues and downtime. To ensure optimal performance and availability, server monitoring is vital. Your server monitoring software should monitor resources like CPU, memory, disk usage, disk I/O, networking, processes, services, and hardware. Server & Application monitor helps prevent application outages and maximize performance by monitoring, tracking, and reporting on statuses, capacity, application, and server performance. Tracking and trending server performance over time is critical to troubleshooting and preventing application issues highlighting trends and thresholds. Using dynamic baselines help you to define "what's normal" and offers better proactive server monitoring by setting set and change threshold values accordingly. The Real-Time Process Explorer (RTPE) in Server & Application Monitor monitors processes running in your server for memory, virtual memory, CPU, and disk I/O. With RTPE, you no longer need to log in to a machine physically or remotely to retrieve that machine’s vital statistics. Server & Application Monitor also provides real-time performance monitoring for metrics such as CPU load, memory load, response time, disk queue, and network throughput, making it a powerful server monitoring tool. With companies having multiple offices, data centers, private and public clouds, remote server monitoring is vital. Using Server & Application Monitor agent and agentless based data collection methodology simplifies remote server monitoring. Have complete control over a server like it was on-premises, regardless of where they reside.